Quick Study: Sergey Kuznetsov’s writings include a monograph on Joseph Brodsky’s poetics, translations of Stephen King and Susan Sontag, and the novel The Circle Dance of Water, a family saga shortlisted for the 2011 Big Book Award. The Kuznetsov File: Kuznetsov’s fiction before The Circle Dance of Water includes a trilogy of detective novels, Butterfly Skin about a serial killer, and No, a futuristic novel written in collaboration with Linor Goralik. 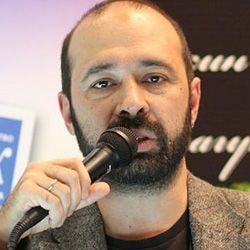 Kuznetsov, who has been writing for the Internet since the mid-1990s, founded Sergey Kuznetsov Content Group in 2003 to work on journalism and social media projects, the most prominent of which is Buknik, a site focused on Jewish culture. Psssst………: Kuznetsov studied chemistry at Moscow State University… And he says he believes books should be available at no charge: he puts his own texts in online libraries. Kuznetsov’s Places: Moscow. Stanford University for a Knight Fellowship in 2001-2002, when he was a contributing editor at Lenta.ru, a Russian news site. Kuznetsov Recommends: Leonard Cohen. Leonid Yuzefovich’s Журавли и карлики (Cranes and Pygmies), which Kuznetsov called a great novel because of its compassion. Won the “Person of the Year-5771” award from the Jewish Cultural Center in the journalism category for his work on the Web site Buknik. Anthologies: “Moscow Reincarnations” is in Moscow Noir (Akashic, 2010, story tr. Marian Schwartz).